This is our bin for garden waste. Many Newcastle residents have these, and the council pays for them to be emptied fortnightly. Or at least, the council did pay. In the new financial year, residents have been asked to pay an annual subscription fee of £20 if they want to continue using the service. In times of austerity, garden waste collection was evidently not seen as the city’s most essential service. Yet, the council has, it seems, dug itself into a bit of a hole. Only 24% of eligible residents signed up for the scheme, which leaves tens of thousands of green bins that need collecting from residents and – more challengingly – storing. The story has even reached the well-tuned ears of The Guardian, which reports that the bins are being temporarily stored in salt depots which are empty at this time of the year. Where they will go next is anyone’s guess. It’s suggested that they’ll be sold on to other councils but, as you can see, they’re fairly comprehensively Newcastle branded, so who’s likely to buy them? I do wonder if this scheme might end up costing the council more than in saves, at least in the short term. Oops! This 1,642nd post was filed under: Photo-a-day 2012, Newcastle-upon-Tyne, Sustainability. Comment posted at 22:20 on 10th May 2012. 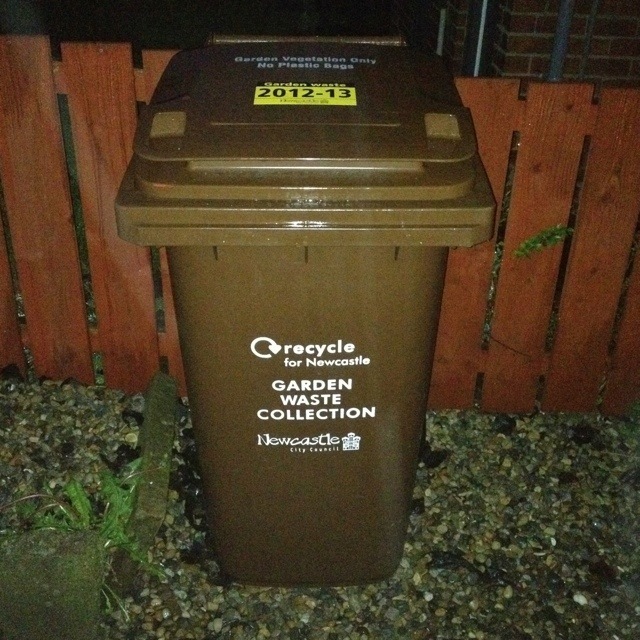 It’s been pointed out that the bin is brown rather than green… but hey, I’m colourblind, go easy on me!